Found 22 file extension associations related to WavePad and 6 file formats developed specifically for use with WavePad. 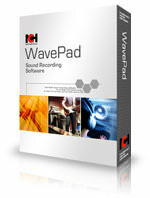 WavePad audio editing software is a full-featured professional audio and music editor for Windows and Mac. It lets you record and edit music, voice and other audio recordings. When editing audio files, you can cut, copy and paste parts of recordings, and then add effects like echo, amplification and noise reduction. WavePad works as a wav or mp3 editor, but it also supports a number of other file formats including vox, gsm, wma, real audio, au, aif, flac, ogg, and more. If you need more information please contact the developers of WavePad (NCH Software Pty Ltd), or check out their product website.